This weekend I took a trip with my Husband, Sister and her Boyfriend to possibly the most beautiful garden I have ever been so lucky to visit. We took a picnic to the Plantation Garden in Norwich, a 19th century garden built in 1856 by Henry Trevor. The weather was stunning and the setting was beautiful, so it would have been wrong to not take some photos! Especially as I was wearing the new Lindy Bop Vera Swing skirt, which I got from Chic Style Boutique. If you are a geek like me, you will care just as much about the details of this beautiful Victorian garden as my outfit, so here is the low-down on this stunning place. The Plantation Garden is a Grade 2 listed English heritage registered garden in the heart of Norwich. The garden covers nearly 3 acres and its features include a Gothic fountain, flower beds, lawns, an Italianate terrace, 'Medieval' wall, summer house, woodland walkways and a rustic bridge. It is an idiosyncratic garden, a glimpse into a bygone age and a haven of peace and tranquility...then we turned up with 4 bottles of wine! 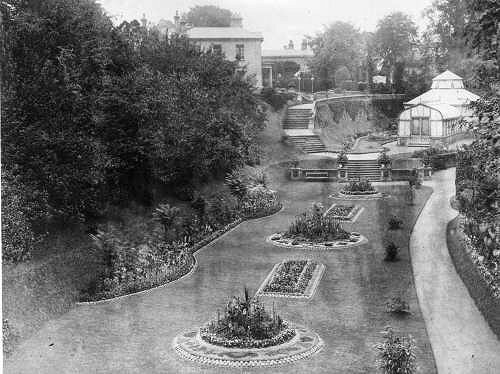 The garden in the 1890s. Source: photograph taken by John Gavin. I was going to wear the Lindy Bop Rosie Leigh twin set which I got in a recent haul from Chic Style Boutique, but I opted for the Vera skirt instead, for two reasons. Reason number one - it was HOT AF. I don't know how hot it was exactly on Saturday, but it was far too hot for trews. Reason number two, was that my Husband said it made me look like a Matador! Vera it was! I paired the Vera swing skirt with my Deadly Dames Voodoo Vixen Top from Pinup Girl Clothing and bamboo bangles from Lady Luck's Boutique. I took a bit of a gamble with this skirt, as the colour pallet is not quite as muted as I am used to! I try to avoid brights if I can, because they tend to wash out my already pale complexion. However, when paired with a black top, this skirt exudes just the right pop of colour, without looking like summer has thrown up all over me! In terms of quality (something which is always an unknown with Lindy Bop) it is perfect. The skirt is fully lined and the zip and seams feel secure, which, for £25 is good news! This skirt does zip to the side though, something my Husband kindly pointed out to me after we had taken all the photos with the seam running right down the front of the skirt! Fit wise, the skirt is pretty spot on. The skirt is listed as coming in at 25.6 in and I have a 26.5 in waist, so there is clearly a bit of give there. I tend to find that waist measurements from Lindy Bop are generous, while bust measurements can be on the tight side. The length was also perfect for me; something which can be tricky as I am on the short side at 5ft 2". Overall, this is a great skirt for a range of purposes - work, play and just general errand running. It is super comfy, good quality, the fit is good and the colour and pattern detailing is really unusual. I would definitely recommend Vera and Chic Style Boutique, who sent the skirt out to me super quickly! I have more items from my recent Chic Style Boutique haul to review, so do keep your eyes peeled for those coming soon! !